Bhutte ka kees is a popular and delicious street food of Madhya Pradesh prepared using corn, spices and milk. Bhutte is nothing but a corn. Generally, grated corn is used but if it is unavailable, corn kernels can also be used by grinding it coarsely. The grounded/grated corn is cooked with spices and simmered in milk to get a delicious and creamy dish. Prepared this yummy and quick dish for an event Shhh Cooking Secretly Challenge hosted by few co-bloggers. 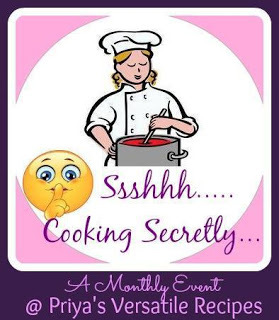 Click HERE to view all my previous recipe posts prepared for this event. And for October month, I was paired with a wonderful and talented blogger Seema Duraiswamy Sriram who blogs at mildlyindian.com. She gave lemon and coriander leaves as a secret ingredients and using those, prepared Bhutte ka kees which was a big hit in my home. Especially, my father loved this dish a lot and asked me to prepare it again after couple of days. Bhutte ka kees can be served as a great tea time snack or as a breakfast. No side dish is required for this dish. Though grated coconut is optional in this recipe, the addition of it gives a lovely taste. Click HERE to view a tasty recipe prepared by Seema by using a secret ingredients given by me. Heat oil in a pan and mustard seeds. Once it starts spluttering, add cumin seeds, turmeric powder and hing powder. Now add the chopped green chillies followed by grated ginger and coarsely ground corn. Saute for a minute and add milk. Simmer the flame and cook until the milk evaporates and the mixture thickens. Now add the required amount of salt and mix well. Switch off the flame and add lemon juice followed by finely chopped coriander leaves. Serve as evening snack along with tea or as a breakfast. The Bhutte Ka Kees looks mouth-wateringly delicious! So inviting! Extremely inviting the bowl looks with kees, grated coconut and green chillies. Perfect indulgence for winters. I love this snack .. I had made it some time back too. Lovely presentation. I am totally drooling at this, can't wait to get hold of fresh corn to make these! Excellent tea time snack for me.. Hard to resist to those alluring bhutte ka kees, well done sis. I think i can feel the aroma here.. squeeze that lemon and I will follow you whereever you take that bowl. Mouthwatering. Such a filling and healthy dish that goes perfect with a cup of tea. I liked the photography and presentation. I really like bhutte ki kees and can go back to so many evenings when we went to Saraf bazaar in Indore to have a hot bowl of kees. Why do you keep coconut optional :-) I just love it's texture and the subtle flavour with the kees. Thanks for sharing. I am sure this lovely, vibrant Bhutte ka Kees appeals to all 5 senses leading to one being truly "santrupt". Love this recipe, a different way of cooking butta and perfect with some hot phulkas. Loved this yummy and healthy snack. perfect snacking item must say. Pass the bowl it looks beautiful. Bhutte ka kees is the yummiest food ever. Bhutte ka khees looks so delicious, ideal with a cup of hot tea. Same pinch Priya..I have also made this delicacy for the challenge. Totally loved this snack. Perfect tea time accompaniment.